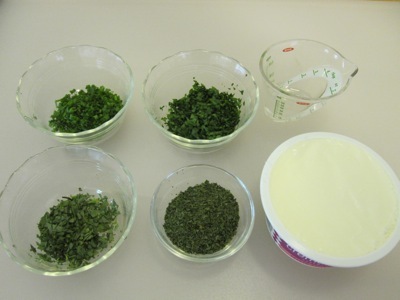 I made the sauce first, assembling nine grams each of minced chives, chervil, and flat-leaf parsley, three grams of minced tarragon, twelve grams of water, and 250 grams of crème fraîche. 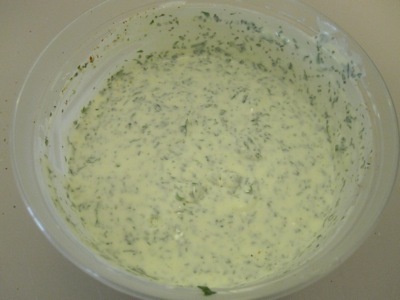 I added the herbs to the crème, then mixed in the water, and stored the sauce in the fridge. I trimmed the tough ends of 72 asparagus, but did not peel them since they were very thin. Keller recommends tying the spears into individual bundles, but I chose to forgo that bit of fussiness. 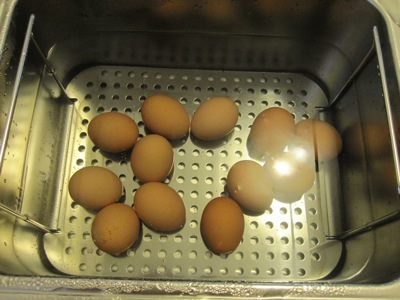 An hour before I planned to serve the dish, I put a dozen eggs in the water bath set at 62.5 °C. I set a large pot of heavily salted water to boil, then prepared a large bowl full of ice water. Just before I served the first course, I blanched the asparagus for six minutes, then shocked them in the cold water before draining them dry on a towel-lined tray. For the final assembly, I spooned the sauce onto each plate, topped with six asparagus spears, then cracked open a soft-boiled egg on top of each. I finished the dish with some black pepper and fleur de sel. 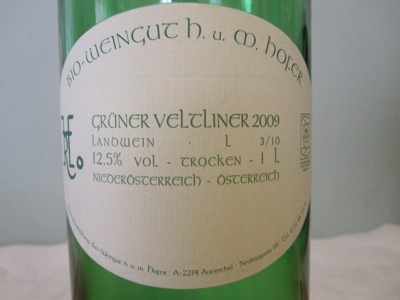 I served a 2009 Austrian grüner veltliner, a crisp, mineral-y white that held up well against the strong tastes of asparagus and egg. 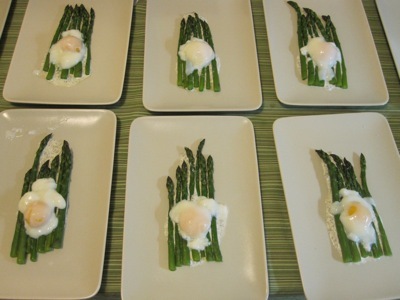 The dish presented two classic pairings: the egg and herbs, and asparagus and egg. I had hoped that the egg yolk would have been a bit runnier, I think the longer cooking time left less margin for error (contrast with previously prepared slow-poached eggs which only cooked for 45 minutes). That flaw aside, the tastes were still dead on. And to any smartypants readers who ask “What about the butter-fried croutons in Keller’s recipe?” I can only say: I burned them. Twice.